Creations by Wendalyn: Is it Friday Yet? I don't know about you but I am so ready for this week to end. Plus I have to work late tomorrow night ughhhh. It's supposed to be -25 tomorrow evening I just heard. I just absolutely hate cold weather and winters uck uck uck. I had another small mail day today from Stamp and Create. I didn't get a chance to take pictures yet. So here is a card I made this past weekend. I love this little pig makes me smile. 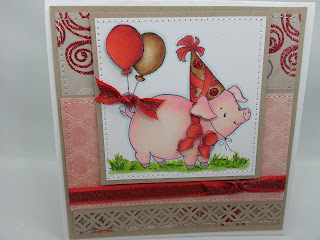 This little pig is from Chrissy Armstrong and is available at Whimsey Stamps. I used some paper I think maybe My Minds Eye. I don't remember I only had one sheet of it. The ribbon I got at Michaels and colored this one with Copics. It's in my Etsy Store I will try and remember to take a picture of the stamps I got today and post them later... Have a good evening..